With an awesome name like Maguronald, which sounds an awful like lot McDonald’s when pronounced in Japanese, this is definitely worth checking out. Maguro, or of course, tuna, is the specialty of this small 20 seat restaurant in Ginza. It is open for lunch and dinner and closed on Sunday and holidays. And affordable, budget about 1,000 or 2,000 JPY per person. Beer, shochu, and sake is served. The menu is very simple, tuna zuke (sashimi marinated in soy) donburi (rice bowl), chutoro, sashimi, tatsuta-age (think fried chicken made from tuna), and tuna yakitori. There are some vegetable side dishes as well. A lot of this is food we often eat at home, especially the sashimi and the tuna zuke donburi. 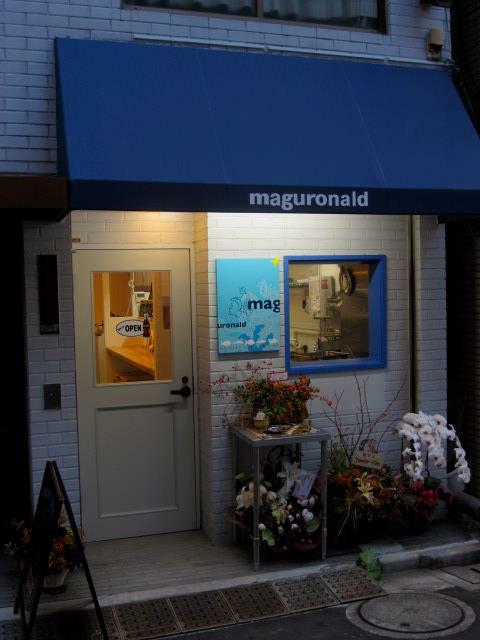 It’s really comfort food and if you like tuna, you’ll love Maguronald. No website yet, just a facebook page.